Enjoy a horseback riding vacation in Spain through country that inspired famous artists like Salvador Dali and Picasso. Horse ride the Mediterranean mountain wilderness and beautiful beaches. The Catalonia region and Costa Brava hold diverse terrain and history and the mild climate allows for year-round riding holidays. 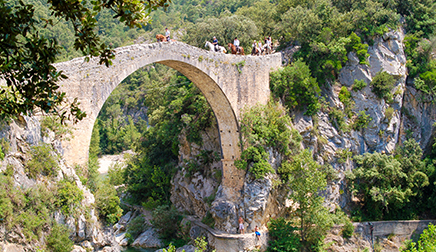 Ride back in time to historic villages with natural stone houses and romantic architecture. Trek into the spectacular Pyrenees mountains and onto timeless Spanish beaches along the Mediterranean Sea. Ride beech forests, canyons and past extinct volcanoes. Explore the real Costa Brava, a diverse region of extraordinary natural beauty and heritage. Medieval fishing villages dot the wild coastline where rocky coves are backed by pine covered hills. Ride Andalusian and Spanish horses for a dream riding vacation in Spain. Foodies will enjoy the Catalan and Spanish food.There are a wide variety of inn to inn riding vacations, camping trips and more in Catalonia for intermediate to advanced riders. Check out Spain riding vacation itineraries to learn more. Here are some suggested items for your Spain riding vacation. Two pairs of cotton Jodhpurs, as they protect the legs from soreness. • Riding boots should have a sole with tread and be confortable for walking, as the riders are certain to lead their horses in some occasions. Jodhpurs boots and half-chaps are a more flexible combination for confort and legs protection than long riding boots. • not necessary to take own water-bottle, we have here for everybody. These can be carried in the saddle-bags provided. • good wet weather gear. Although it rains very little, when it does it is normaly a heavy downpour, consequently a jacket or cape and waterproof trousers are a good idea. • bathing suit! If not in the see, for SPA or swimming pool. In the meantime, check out our general tips for packing for equestrian vacations. The horses are well schooled pure or crossbred Andalucian. They have all been carefully chosen and most are between 14.2hh (150cm) and 16hh (165cm) and are of a medium build. They are sure footed, fit, forward going, responsive to ride and well adapted to the requirements of the sometimes rough terrain. The horses are all trained using natural horsemanship techniques which helps to create an enthusiastic, good natured horse that is keen to collaborate with its rider, and really enjoys its work. Tack is English style and most horses are ridden in snaffles. We use trekking saddles for the trails and English saddles for the lessons. If you want a western saddle, contact us. Saddle bags are provided to carry items required during the day and for picnic lunches. Catalonia is rich in scenery, history, culture and adventure! Enjoy great Spanish food on these Catalonia riding holidays. Accommodations vary according to the riding vacation and include rural guesthouses, pensions and small hotels. On most rides the horses are corralled in nearby paddocks and you walk a short distance to your accommodation for the night. Please see each itinerary for accommodations. Fit, competent riders and their non-riding companions who want to experience the diversity of the mountains, beaches and historic villages in this beautiful part of Spain, not far from Barcelona. Ride on Spain's beaches and spend New Year's Eve in the saddle! From 28th December to January 4th, enjoy six days in the saddle with a delicious dinner and friendly party on night New Year's Eve. Today, after saddling the horses we are ready to leave, 200 km ahead. The horses are fresh and ready for the adventure. With lots of long canters and gallops through the Alt Empordà pine forests. Every hour we pass another beautiful village, castle, churches, arches, tunnel, old wooden doors with wrought iron knockers, the beauty of the stonework of the past. As the afternoon draws on you can sense the proximity to the coast and at last we arrive at the Mediterranean, the beautiful gulf of Rosas stretches before us. After an early start, we trot our horses 1 km down to the beach. The long curve of the bay of Rosas stretches before us, kilometers of golden sand. Here we enjoy some excellent canters and gallops on the beach. After the beach ride, we head inland again following the river Fluviá, past a bird sanctuary where we can see flocks of migrating birds. The terrain is flat with lots of rice fields and peach, pears, and apple orchards. The pace today is lively. By lunchtime we arrive at our destination Castelló d´Empúries for an amazing picnic. During the afternoon, you can explore Castelló d´Empúries and do some shopping. You also have the possibility to go to Figueres to visit the famous Dali-museum. Castelló d´Empúries is a lively cathedral town where we can enjoy some excellent tapas and cold drinks on one of the nice terraces and the local nightlife. Today we ride through typical Mediterranean brush wood forest, thick with bushes and calcareous soil. This is a rocky area with old buildings of traditional rural architecture like shelters for herders and small stone walls. From the village of Terrades, the route will take to reach our diary stop in Sant Marti Sasseres for picnic at lunch time. We follow the north bank of the river Fluviá where we can enjoy the spectacular fluvial scenery with lots of different bird species. We cover many miles in a short time in the wildness Garrotxa through sunflower fields, open meadows and forest. Our destination for today is Besalú, a medieval walled village. This ancient capital is a jewel of Romanesque architecture set between two rivers. The squares, stone cut pillars and cool shady arched passageways are a wonder to behold. Not to mention the stained glass of its churches. You have some time to wander around and absorb the unique atmosphere of this ancient medieval village with its spectacular bridge and Romanesque architecture. In the morning we leave from Besalú into the forest and over the rolling hills around. We will cross Crespià, a village surrounded by large prairies and our picnic will take place at Espinavessa. On our way, we will find country cottages and churches, all surrounded by olive groves and cereal fields. After lunch, we continue our journey into the Alt Empordà region alongside the Fluviá river and after some good canters we hit the village of Bàscara with its famous hippodrome, where we will test our gallop. For the last part of today, a gentle ride following the river and into the village of Calabuig where we can appreciate the XVth century castle/church, build on a hill overlooking the Alt Empordà 360º around us. Our destination for today is Can Sort. Breakfast and departure or head on to nearby Barcelona for more fun in Spain. Gallop through surf on sandy beaches, ride through old villages, pass Romanesque churches and more on the Mountain to Sea Spain Riding Vacation. We leave the foothills of the Pyrenees, fringed by the long curve of the Bay of Roses, to ride miles of beaches! Gallop of your life in the surf, before riding beautiful villages, castles and churches including Castelló d’Empuries, a lively cathedral town. Ride through the fantastic nature of the Alt Empordà. Discover small medieval villages such as real Besalú, Crespià and Bàscara. Cross hills and fields of wheat, poppies and sunflowers. Discover forests full of wild herbs. Canter on coastal meadows and small winding creeks. Alt Empordà is full of culture, history and natural diversity. You will arrive to Can Sort. Located on the Pyrenees’ feet, facing the natural and wild reserve of the Medes Islands, the guesthouse and its camp site, will make you discover the Empordà, his preserved nature, riding trails. The multiples pleasures of the mountain and the country-side holidays. Holiday’s nature close to beach and Figueres, and not far from Girona and Barcelona. The ideal place for a horse riding holiday and an original way of discovering the region. Before dinner we will go over the week's program. Hear about the special characteristics of our Spanish trail horses. You will be given an introduction to the week´s program with an opportunity for a one-to-one conversation designed to find every rider their perfect horse. Then, you can enjoy a fantastic dinner! Today, after saddling the horses, enjoy lots of long canters and gallops through the Alt Empordà pine forests. Every hour we pass another beautiful village, castle, churches, arches, tunnel, old wooden doors with wrought iron knockers, the beauty of the stonework of the past. As the afternoon draws on you can sense the proximity to the coast and at last we arrive at the Mediterranean, the beautiful gulf of Rosas stretches before us. Our hotel for the night is right on the beach. After an early start, we trot our horses down to the beach. The long curve of the bay of Rosas stretches before us, kilometers of golden sand. Here we enjoy some excellent canters and gallops on the beach. After the beach ride we head inland again following the river Fluviá, past a bird sanctuary where we can see flocks of migrating birds. The terrain is flat with lots of rice fields and peach, pears, and apple orchards. The pace today is lively. By lunchtime we arrive at our destination Castelló d´Empuries for an amazing picnic. During the afternoon, you can enjoy the swimming pool at the hotel you or explore Castelló d´Empuries and do some shopping. You also have the possibility to go to Figueres to visit the famous Dali-museum. Castelló d´Empuries is a lively cathedral town where we can enjoy some excellent tapas and cold drinks on one of the nice terraces and the local nightlife. Today is a long day in the saddle. After an excellent breakfast on the magnificent roof-top terrace of the hotel over-looking the cathedral with the Mediterranean on one side and the gentle curve of the Pyrenees on the other, we saddle up again to continue our journey to the mountains. Today the riding is spectacular, once more a lively pace as we trot and canter out across the planes, through fields, meadows, and Mediterranean woodland rife with the scents of wild herbs and flowers. In the afternoon we ride through cork trees, olive groves and vineyards and past the lake of Boadella. Today after saddling the horses we are entering in the most isolated area to the whole trail. Flora, wildlife, nature, we are going to enter in the wildness of the Alt Garrotxa. During the morning we ride through rolling hills and pine and oak forests. When we get to the river la Muga, we stop to take a bath under a medieval bridge at the entrance of Sant Llorenç de la Muga charming village. We continue through scenery of where it is very likely to meet herds of sheep or wild boar. At dusk we arrive at our destination, Sant Martí Saserres, with his famous church, where we leave our horses to graze and rest. Today the assistance translates us by car to the Hotel Masia La Palma in Espinavesse. It is a house dedicated to rural tourism where rooms are rented without losing the charm of the place where Tonia and Andres are the perfect hosts. We follow the north bank of the river Fluvia where we can enjoy the spectacular fluvial scenery with lots of different bird species. We cover many miles in a short time through sunflower fields, open meadows and forest. We stop in Besalú where we have a delicious picnic lunch by the river. Besalú, a medieval walled village, ancient capital, is a jewel of Romanesque architecture set between two rivers. The squares, stone cut pillars and cool shady arched passageways are a wonder to behold. Not to mention the stained glass of its churches. You have some time to wander around and absorb the unique atmosphere of this ancient medieval village with its spectacular bridge and Romanesque architecture. Our destination for today is the Hotel Masia La Palma, where we’ve staying yesterday. The house dates back to the seventeenth century and has been carefully restored. The swimming pool and the living room are all at our disposal and there is the possibility to enjoy a private Spa or a massage. In the restaurant they serve a traditional cuisine based on the finest local ingredients and on some old family recipes. In the morning we leave from Vilert into the forest and over the rolling hills around the village of Ollers, with its church dominating the area. Here you find some majestic farm houses built by the nobility in the XVIIth century. With amazing views on the Pyrenees behind us, we enter the historic village of Galliners with some fine examples of Catalan architecture. We travel through forests full of aromatic herbs and wild flowers and we stop for an excellent picnic surrounded by Rosemary bushes. After lunch we continue our journey into the Alt Empordà region and after some good canters we hit the town of Bàscara, alongside the river Fluvià. For the last part of today, a gentle ride following the river and into the village of Calabuig where we can see the XVth century castle/church, build on a hill overlooking the Alt Empordà 360º around us. Our destination for today is Can Sort. Once we arrive, you can relax in the gardens or have a swim in the swimming pool. Cristina and Jaume will make sure that we feel at home and serve us a fantastic home cooked meal. Discover the Catalan Coast on horseback. This trip is great for beach lovers! Ride through the fantastic landscape of Empordà and Costa Brava. Beach and Meadow trails will allow you to discover the Costa Brava. It is a beautiful strech of coast and this area has a rich medieval history, beautiful scenery and a great artistic heritage. It has been voted one of the "Best of the World Destinations" by National Geographic Traveler Magazine and deservedly so. You will also discover a nature reserve, the Parc Natural dels Aiguamolls de l'Emporda. This Park is popular spot for bird watchers. The Park is built on marshy land and shelters predominantly aquatic birds. More than 300 different species have been sighted here. Ride beaches, sand, natural dunes, precious villages, castles and churches. Discover small medieval sites such Peretallada, Torroella de Montgrí and ride through two sandy beaches. Experience the most exciting gallop on the fringe of the sea. Beach and Meadows trail has the perfect formula for a unique and unforgettable horse riding. Located on the Pyrenees’ foothills, facing the natural and wild reserve of the Medes Island, the guesthouse and its campsite will allow you to discover l'Empordà, his preserved nature, riding trails. Holiday’s nature close to beach and Figueres, and not far from Girona and Barcelona. The ideal place for a horse riding holiday and an original way of discovering l'Empordà. Before dinner you will be told about the special characteristics of our Andalucian trail horses. You will be given an introduction to the week´s programme with an opportunity for a one-to-one conversation designed to find every rider their perfect horse. Then, you can enjoy a fantastic dinner! Today is a nice day in the saddle. With lots of long canters and gallops through the Alt Empordà pine forests and rolling hills. As the afternoon draws on you can sense the proximity to the coast and at last we arrive to the Riomar Hotel in Sant Martí d’Empúries, a scenic little world set in one of the most beautiful bays in the Mediterranean, el Gulf of Rosas. Surrounded by areas of authentic natural beauty Sant Martí d’Empúries is located near the famous ruins, with the same name, of the first Iberian Peninsula Greek city and keeps a perfect balance between land and sea, between the greens and yellows of its orchards and the blue and gold of the village´s extensive beaches and historic past. After a so early start, we trot our horses 1 km down to the beach. The long curve of the bay of Rosas stretches before us, kilometers of golden sand. Here we enjoy some excellent canters and gallops on the beach. After the beach ride we head inland again following the river Fluviá, past a bird sanctuary where we can sea flocks of migrating birds. The terrain is flat with lots of rice plantations and peach, pears, and apple orchards. The pace today is lively. Our destination is Castelló d’Empúries, a lovely medieval village, aparted from the sea front to protect better his inhabitants from the corsair intrusions at XVIth and XVIIth century. We will start our trail going down to Baix Empordà. In spite of being a prosperous area, it still conserves the traditional rural and village way of life. The paths and tracks have not been asphalted nor has the countryside been fenced off so there is an unlimited combination of paths and bridleways to explore. Every hour we pass another beautiful village, castles, churches, arches, tunnels, old wooden doors with wrought iron knockers, the beauty of the stonework of the past. At lunch time we will have our daily picnic in an evergreen oak forest. In the afternoon, we will arrive at Can Sort from we’ve start three days ago. We start from Can Sort but today in the contrary direction as the first day. South direction, to the river Ter, purchasing the Castillo de Montgrí outline, located at the top of the mountain mass who have got his name. We will arrive to the river Ter riding in routes and paths in the middle of forests and meadows, and at the end along rice fields, to arrive at the mouth of the river and the sandy beach of Pals, 8km long, with a view of the Medes Islands in the distance. Our hotel is in front of the beach. After an early start, we trot our horses down to the beach. Here we enjoy some excellent landscape on our second beach in this trail. In Fonollera beach, the river forms a lagoon then enters it fully into the sea, in front of the Medes Islands. Riding your horse through the natural spaces of La Gola del Ter, La Platera or El Ter Vell will give you a view of the coastal plant life and the fauna of maritime-land areas. After the beach, we ride along meadows and rice fields to arrive at Peratallada. This lovely village is carved of stone from the moat which surrounds Peratallada. Indeed its name means 'carved stone'. Defensive walls surround parts of the village and there is also a stone castle. It was one of the best fortified medieval villages in Spain. The entire route goes through a countryside that combines fields of crops, which sinuously cut into the clearings of Mediterranean woods, with small scattered human settlements, that are integrated into the territory. We ride through mosaic countryside, enjoying some excellent canters and gallops. We enjoy our lunch near a natural well, welcome refreshment for us and the horses. Back on our horses for the last part of today, a gentle ride following the path leads us to Can Sort. Riding, relaxing and sunbathing are all part of this breathtaking Mediterranean Coastal Trail Riding Holiday which starts off in the Empordà wilderness with its rolling foothills heavily forested with oak, cork and beech and visits the most spectacular part of Catalonian coast. Canter and gallop through forests of rosemary and thyme by the river Fluviá and out of the rolling hills onto the plains to visit Sant Marti Sasserres, an incredible XII century church and rectory. The Albera wine region offers olive groves and vineyards with intense natural beauty and obligatory sampling of the local wine at a charming bodega. Venture through the Aiguamolls natural park which is home to flamingos and exotic birds before reaching Spain’s eastern-most point, the huge peninsula of Cap de Creus, with its spectacular views of the rugged coastal rocks bays. Talavera Bay is an authentic smugglers cove with a fantastic beach and crystal clear waters. Soak up the lunar landscape of Cap de Creus, inspirational to one of Spain’s most famous artists Salvador Dali and to all who visit. Spend a night in a unique Mediterranean town of white houses, the fabulous Cadaqués. You will arrive to an exclusive guesthouse and equestrian center for tourism accommodation, located on the Pyrenees’ feet, facing the natural and wild reserve of the Illes Medes. Its camp site will make you discover l'Empordà, his preserved nature, riding trails. The multiple pleasures of the mountain and the country-side holidays. Holiday’s nature close to beach and Figueres, and not far from Girona and Barcelona. The ideal place for a horse riding holiday and an original way of discovering the region. Before dinner we will go over the week's program and sample some of the full bodied local real wines. You will be told about the special characteristics of our Spanish trail horses. You will be given an introduction to the week´s program with an opportunity for a one-to-one conversation designed to find every rider their perfect horse. Then, you can enjoy a fantastic dinner! After breakfast and tacking up, we leave Can Sort following a ridge with spectacular views of forest, rosemary and thyme. Up to the river Fluviá, out of the rolling hills onto the plains, we canter and gallop through olive groves and fields of wheat, past country farmhouses and churches and into the foothills of the Empordà. We have our daily picnic at Masia La Palma. Our destination today is Vilanant, to Masia Mas Jonquer where you will enjoy a comforting diner and a deserved rest. Today we leave the forests and prairies to roam through Albera’s wine region. Its open landscapes with vine and olive grapes and the mountains in the horizon shape a beautiful natural area. After a placid picnic at Peralada, we will visit the town at coffee time. The afternoon’s route to Garriguella is characteristic for its vineyards. Once there, we can have option to taste the best local wines of Gelama winery. Even the French cross the border to buy wine here! Possibility of Spa and comforting massage. Leaving Albera's natural park behind, our route through la Serra de Rodes will allow us to have a sight of the bay of Roses to the East. After having the picnic surrounded by these wonderful views, we will cross the gate of the Monastery and Castle of Sant Pere de Rodes. Then, we will descend through different tracks, some of which will be walking to Port de la Selva. This fishermen town is located in a nice little bay. Close to the port, we will find our hotel, which has an excellent spa. Feel free to enjoy swimming in the sea before having a delicious dinner outdoors. Today we ride further along the Cap-de-Creus, a peninsula of sculptured rock full of flowering shrubs, a truly lunar landscape. This is Salvador Dali country, the area inspired many of his paintings. This morning we will have spectacular views of the Mediterranean coast. We lead our horses down to Caballera Bay, a smugglers cove and fantastic beach, where we have a picnic, a swim (without the horses!) and do some sunbathing. Following a lovely afternoon on the beach we ride on to the ridge above the village of Cadaqués, where we finish our horse trail. This village has in its time attracted Picasso, Man Ray, Thomas Mann and Salvador Dali. Salvador Dali and his wife lived nearly at Port Lligat where his house has been opened to the public. The House-Museum Salvador Dali is open from March to December. We leave the fantastic village of Cadaqués through tiny mountains to reach Cap de Creus peninsula. This place offers impressive views, with kilometers of wild rocky coast, cliffs and small bays. Lunch will then take place near a lake, where it is possible to swim. To the south, we can appreciate the view of the beach awaiting us for the long galloping of the next day. Then, we will leave the mountains in the afternoon through terrace farming vineyards. Our next destination is Castelló d’Empuries, dominated by its impressive cathedral. As the former capital of the region, far from the coast, it offered good defense against corsairs. In the hotel we will find a swimming pool, surrounded by a beautiful patio. You can also enjoy the town’s possibilities, such as shopping, tapas and nightlife. After an excellent breakfast on the magnificent roof-top terrace of the hotel overlooking the cathedral with the Mediterranean on one side and the gentle curve of the Pyrenees on the other, we saddle up again to continue our journey through the Aiguamolls, riding downhill the Fluviá River to the sea. The Aiguamolls is a natural park, home to flamingos and other exotic birds. In the afternoon, we will continue through l’Alt Emporda, with good galloping before reaching Saus. Today’s last part will take us through scent full forests of thyme and rosemary until we reach Can Sort. Once we leave our horses at rest, we just have to enjoy the gardens and the pool. Cristina and Jaume will make sure we feel like at home and serve a wonderful dinner. Breakfast and departure and we hope to see you again next year! Forget everything you think you know about mountain riding. The Smugglers trail is very special and a true trip for foodies. Discover one of the loveliest regions of Catalonia. The food in the mountain hotels is of a high culinary standard. You have the opportunity to taste different delicious Catalan dishes and three distinct landscapes: the fertile prairies near the river Fluvià, the mighty peaks of the Pyrenees and the warm wooded hills of the Garrotxa. This Catalonia riding holiday is diverse trip through the mountains. In the evening upon your arrival learn about the itinerary for the week’s riding vacation. Hear also about the special characteristics of our Spanish and Arab crossbred horses for this trail. Then you can enjoy a fantastic dinner! We have a copious breakfast, prepare our horses and depart. Then, we cross the river Fluviá to reach Báscaras’ hippodrome, where we will test our skills with a long gallop. Next, we will have a picnic and know each other before riding again through prairies and Mediterranean forests to the hotel Masía La Palma, an ancient farm transformed in a comfortable country house. The peaks of the Alta Garrotxa are all around us. The air is poignant with the smell of wild herbs and Mediterranean fragrances. Later tan long gallops, in the far distance we can make out the medieval village of Besalú, where we have our picnic at lunch time and that we can visit later than coffee. A jewel of a Romanesque city, with its bridge over the two rivers and Jewish past, with its old neighborhood almost intact. The ride is upbeat. The strong Andalusian horses are still full of strength. Their trots are long and rhythmic along the small climbing paths between country cottages with amazing views of the Pyrenees. We will then spend the night at Besalú where we will discover this medieval town nightlife. This spectacular scenery is the gateway to the region of the Alta Garrotxa, one of the region’s most beautiful natural parks. Up the mountain, in a very big oaks forest, we let our horses to pasture and we go to sleep to Besalú. Near the bridge, we will find again our comfortable hotel “Los Jardines de La Martana”, surrounded by beautiful gardens, and with its impressive library. From here we have spectacular views of "La Costa Bona", our goal for this journey, Queen of the Pyrenean peaks that we can discern in the far distance. After a walk down into the next valley we eat a delicious picnic next to a little river. This is an ideal spot to swim with your horse. The views are immense and breathtaking, the light is that of the Pyrenees. We pass herds of cows and savage horses grazing up here for the summer. Up here it is very common to see eagles, vultures and herds of wild goats and deer. After days of riding in the countryside it is nice to arrive at Camprodon, a lively market town, favored by the Catalan aristocracy in the past. The hotel is situated right in the center, a great opportunity to do some shopping and visit the local bars. This riding vacation is not far from Barcelona and an exciting mountain trail through the Cathars history. The Pyrenees “Bons Homes” route was very useful for the Cathars in their exile from France during the XII, XIII and XIV centuries. This Catalonia equestrian vacation takes you from the Castle of Montsegur near Foix in France to the Queralt Monastery in the Berguedá (Barcelona Province). Experience farmhouses, hermitages, and castles ruins. The riding vacation includes part of the “Bons Homes” route, riding through the Berguedà region, where we will discover spectacular natural landscapes. The trail begins in the Baix Berguedà near the Catalan village of L’Espunyola (over 2600 feet/ 800 m altitude), spending the first night at the Hotel-Restaurant Cal Majoral. Before dinner, you will be told about the special characteristics of our Spanish trail horses. You will be given an introduction to the week´s program with an opportunity for a one-to-one conversation designed to find every rider their perfect horse. Then, you can enjoy a fantastic dinner! Day 2 “Bons Homes” routeToday we are entering in the rocky and craggy walls of the Alt Berguedà landscape, while our destination the magic mountain. After passing the first foothills, we arrive at Capolat, where we can have a break on the flat terrain. Then we leave the tunnel of Jouet to the right and we can have a pleasant gallop until arriving to Campllong, where we will have our daily picnic under one of the most emblematic icon of the Catalanism, “the three branches pine”. In the afternoon, the ride continues to the Corbera Monastery where we will discover in the horizon the Queralt sanctuary. At the end of the day, we arrive at the Casanova de Les Garrigues, the historical starting point of the “Bons Homes” route. We are now at 4,200 feet/ 1.300 m altitude. Day 3 Up to the Dinosaurs TraceNice day on the saddle; after an excellent breakfast, the ride begins through the Baga de les Nou Comes, a spectacular beech forest. Then we have to dismount for 50 meters to cross an old mine tunnel, to arrive at the other side of the valley with more typical Pyrenees land aspect, red pine and fir trees. We ride up and up to the proximity of the village of Peguerà and its smooth pasture where we can enjoy our picnic at lunchtime. We continue our journey over the Vallcebre cliff, crossing Fumanya where we can observe the fossil tracks of the dinosaur’s age on its high grey stone walls. The altitude is now over 5500 feet/ 1.700 m and the views are incredible over the Catlarás region. We finish the day going down through a narrow path to Cal Barbut where we will have a delicious dinner. After a much needed copious breakfast, we saddle our horses and we are ready for the longest day of the week. We turn back up to the deserted village of Peguera, galloping into the green and nice valley. We turn around the Gallina Pelada summit with its impressive Ferrús wall and ride down slowly to the Gósol valley, our destination today. For first time, we discover the magic mountain, Pedraforca, imposing and majestic from the distance. During the next days we will ride around it, but for today we need a deserved rest. We spend the night at Hotel Cal Franciscó at Gósol, where the altitude is over 4500 feet (1.400 m). Today it’s not necessary to prepare our luggage: we will turn back to spend night at Cal Franciscó. We will follow a slowly ascending route to the “Cim del Verd” mountain, where we will gallop on its Green hills. Here we will enjoy the magnificent views over Tuixent and the imposing Pedraforca, very close to the other side of the mountain, through which we will descend after having a picnic on the Summit at over 7000 feet. If needed, you can today stay at the hotel for a rest. We leave from Gósol, abandoning the dense forest and we climb smoothly to the Pedraforca mountain pass where we can appreciate its most imposing side. The paths follow on the South slope of the long Serra de Cadi, without losing altitude and going round the edge of the mountain. We come closer to Gisclareny, a small mountain village, and we finally arrive at the Rústic Vilella guesthouse where we will spend the night, again at over 4500 feet (1.400 m) altitude. Day 7 Down Into the ForestOur destination for today is Bagà. We go down through the forest full of wild flowers and aromatic smell, passing by the Dou fountain, where the Bastareny River begins. Coming back without hurry to the civilization. After a delicious picnic near the river, we will rest at the Hotel-restaurant El Moli del Casó, where the owner will serve us an excellent dinner. Breakfast and departure and we hope to see you again soon! Some of the difficulties may be crossing roads with traffic, dense woodlands, small rivers and unpredictable weather. We will encounter valleys, high mountains, and paths so small that you may think you cannot go along them. The hotels and camping locations on route are all scenic and offer friendly teams of staff to satisfy your every demand. You will enjoy places to rest, take in the view and have a breath of fresh air, all while attending to animals- a brand new experience every day! Can Sort serves as a gateway to the delightful region of l'Empordà and will welcome us to the start of our unique cattle herding experience. A picture is worth more than a thousand words, so I invite you to open the link to our website page so you can start savouring our meeting point and the start of our journey. Before dinner you will be told about the special characteristics of our Arabian crossed and Paint trail horses. You will be given an introduction to the week’s program with an opportunity for a one-to-one conversation designed to find every rider their perfect horse. Then you can enjoy a fantastic dinner! Note: You must bring a sleeping bag and a mat for the nights we camp out, which will be on Wednesday and Thursday. Try to bring only the bare necessities you need with you, apart from proper riding gear including clothes for wet conditions. Above all, come prepared for a great time and in good shape to withstand 6 hours of daily trekking. After breakfast and tacking up, we leave Can Sort following a rodge with spectacular views of forest, rosemary and thyme. Up to the Fluviá, out of the rolling hills onto the plains, we canter and gallop through olive groves and fields of wheat, past country farmhouses and churches and into the fothills of the Empordà. Today we’ll not ride with the cattle, but prepare our team strategy to work tomorrow in perfect coordination. Our destination is to the charming Hotel Mas Jonquer or Mas Pau where you will enjoy a dinner with the cattle herder who will explain at the complete team the organization and precautions to ride with the cattle tomorrow. Wake up time is 7am and After having breakfast, we will pick up our horses, and prepare to begin our journey. Today, the cattle has started at 5:45 in the morning with the herder, our cattle expert, from the farm owned by the “Moixa”. The route we will take to reach our first stop in Sant Lorenç de la Muga Terrades, where we will rejoin the cattle and the herder, we ride through typical Mediterranean brush wood forest, thick with bushes and calcareous soil. This is a rocky area with old buildings of traditional rural architecture like shelters for herders and small stone walls. When we reach the St. Quirze d’Olmells shrine, the vegetation will change completely, and become a Mediterranean forest which will continue until we reach the plains of Palau Surroca and the castle of La Roca. From here on to Terrades we will take a short rest beside the Sant Sebastià shrine. We will ride with the cattle to continue by road, while we climb the Serallonga mountain chain. From this altitude we will be able to see the Boadella marshland and follow it down until it becomes the Muga River, which will then take us to St. Llorens de la Muga for lunch. If you would like to see where we will be staying go to the Bassegoda web site, and you will see the small wooden bungalows where we will spend the night. This is an ideal place for wildlife lovers in the middle of nature. It is a door to the wild, for during the following 48 hours the only traces of civilization we will find are some chapels from the eleventh and twelfth centuries and a few houses in ruins. There is no phone signal during this time. Yes folks, wake up time is 7 am again and after breakfast we will go to the field where our horses are, and prepare everything for the two next days which will include breathtaking views and fresh air. At lunch time, we will join the cattle that have started off earlier in the morning. From now on we will stop seeing roads and cars and we will enter the Massif of Bassegoda that dominates the entire valley. We will follow the paths parallel to the "torrent of Píncaro", a tributary of the Muga River. This will take us towards the Coll de Bassegoda and the Coll del Principi through the special stone stairs called “escaletes”. Here, on this vast open plain of red pine woodlands, we will once again join the cattle. We ride together to the “¨Comella” house for our picnic and leaving here the cattle. We will then ride to the “Morato” where we will set up camp with tents, campfires and spend a lovely evening, leaving the horses to graze freely around us. After breakfast at 7am we will round up our horses and get everything ready to start the day’s route. We have to pick up the cattle at la “Comella” house, where they stayed since the previous day. After having something to eat we will rest and, if the weather’s good (and you’re brave enough!) we will be able to have a swim in the clear waters of the river. Once we have rested we will return to our horses and ride back to the Coll del Principi camping site to spend the night again. Once again, but at 6 o’clock, and after an authentic cowboy breakfast, we will tack our horses up and ride to Morató where we left the cattle the previous day. Once we have all helped to round up the cows, we will start by making our way along a very narrow path which is surrounded by dense woods. We will encounter an extremely thick forest, where we will have to protect ourselves from branches and, at the same time, making sure not to let any of the cows out of our sight. To our left we will see the Pic de les Bruixes, which literally means the “Witches’ Peak”. A precipice will force us to go towards the Coll de les Falgueres magically appearing as a clearing in the middle of this mysterious forest. By now we will have crossed the border into France where the paths will be wider and easier. From here on we will ride down to the river that crosses the village of La Manère and then up the other side towards the Coll del Malrem crossing the border once again, this time back into Spain. Today we are allowing you to sleep till 8 am and after having typical Catalan breakfast we will tack our horses up for the last time. We will then fetch the cattle and lead the herd towards the Rocabruna road continuing from there to a village called Font-Rubí. We will begin our last descent down through the Coll Pregon until we reach the village of Camprodon, which we will cross as the cattle path still passes directly through the middle of the village. Regional and tourist people are waiting for us... our arrival is spectacular! It was fantastic and more than met my expectations. The organisation was faultless, horses very well chosen and the attention to detail was superb. It's one of the best rides I've ever been on. Fodor’s helps you unleash the possibilities of travel by providing the insightful tools you need to experience the trips you want. Although you’re at the helm, Fodor’s offers the assurance of our expertise, the guarantee of selectivity, and the choice details that truly define a destination. It’s like having a friend in Spain! Updated annually, Fodor’s Spain provides the most accurate and up-to-date information available in a guidebook. Fodor’s Spain features options for a variety of budgets, interests, and tastes, so you make the choices to plan your trip of a lifetime. 8-pg. color insert; full-color pullout map. Amazon.com Review- The Sun Also Rises is Hemingway's masterpiece--one of them, anyway--and no matter how many times you've read it or how you feel about the manners and morals of the characters, you won't be able to resist its spell. This is a classic that really does live up to its reputation. Orwell's portrait of the Barcelona uprising and the spirit of a city at war is a classic, an observant and heartfelt report from the streets. In part, this book is the simply told story of a wide-eyed soldier caught up in revolutionary fervor and the allure of Spain. Usual maximum is 11 and minimum is 4.